After bending to demands from Rick & Morty fans to bring Szechuan Sauce back to its restaurants, McDonald's relented and recently re-released the long-discontinued dipping condiment for one day only last Saturday. 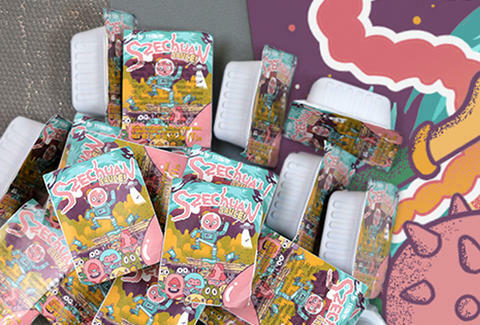 However, the company wasn't prepared to meet the bonkers demand, and thousands of fans of the Adult Swim comedy waited hours for a packet... only to walk away empty handed. To its credit, Mickey D's has promised to unleash more of the sauce soon, but demand has since reached such great heights that one guy actually traded his car for a single packet of the stuff. Seriously. Rachel Marie said she was one of the lucky few to get her hands on some sweet, sweet Szechuan Sauce when it was briefly available in stores, but rather than tear it open and go to town on some nuggets or fries, she decided to save it. She posted a photo of the packet to a Facebook Group popular with Rick & Morty fans, thinking she may be able to trade it for something cool, according to Business Insider. Well, let's just say she was right. Marie quickly received offers for a few pins and things, but figured she'd aim higher and half-jokingly put out feelers for anyone willing to take it off her hands in exchange for their car. Incredibly, one fellow Michigander bit, and offered up his set of wheels -- a bright red Volkswagen Golf MK4 from the early 2000s -- for her single packet of the highly prized condiment. Apparently, the guy (who requests to remain anonymous) has another car, so unloading the Volkswagen wasn't a wholly irresponsible move. But still, according to Kelly Blue Book, a model from that era in good condition is worth anywhere between $2,000 to $3,000, or nearly 1,000 times more than what Marie paid for an order of Buttermilk Chicken Tenders at the Golden Arches to get the Szechuan Sauce. And while trading in your car for an ostensibly free pack of sauce seems downright absurd, the truth is there are lots of people right now willing to shell out top dollar for less than an ounce of the goopy goods on eBay. Once again, let this be a lesson to never underestimate the power (and questionable decision-making) of wacky late-night cartoon fans.